By accident or design, the sumptuously superlative Xu isn’t the only Taiwanese restaurant on Rupert Street. The West End’s most unlikely restaurant side street is also home to Old Tree Daiwan Bee. This oddly-named Taiwanese restaurant originally started out on a site in Golder’s Green and must be one of the few examples of a restaurant moving closer in to the centre of town, rather than further out as one would expect in this torrid property market. Whereas Xu is sleek and cool with a pricey menu of reimagined Taiwanese dishes, Old Tree is far more old school. This small restaurant, with its inn-like interior, almost looks as if it’s been built from sold-off fittings of the largely-imploded Leong’s Legends. Old Tree’s menu is full of classic Taiwanese dishes, but that doesn’t automatically make it a winner. 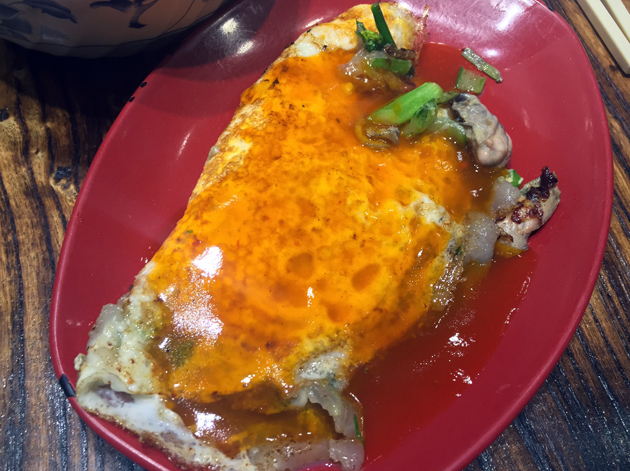 The eggy component of the oyster omelette was almost paper thin and subsequently inconsequential, but filled to the brim with intensely salty and musky rehydrated oysters. This might seem like a cop-out, but actually makes sense, at least in this case – dried and then rehydrated ingredients can taste much more potent than their fresh counterparts. 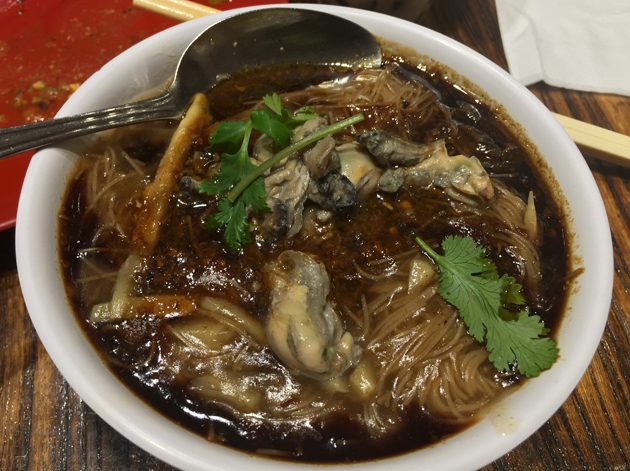 The same dried and rehydrated oysters turned up again in a noodle soup. The wheat noodles were almost vermicelli-like in their thinness. Although some may like such exceptionally thin noodles, I tend to prefer thicker and/or wrinklier noodles as they have more of a mouthfeel to them. The bigger problem was the inky soup. Brimming with a hoisin sauce and worcestershire sauce-like moreishness, it probably depended a bit too much on MSG for its charms given the almost unquenchable thirst that afflicted my throat afterwards. Sorry, there’s a bit of grit in my eye. Desserts here are distinctly Chinese. Crisp and clean-tasting black glass jelly came topped with chunky, earthy taro and musky, earthy and nutty adzuki beans. I found it to be a distinctly flavoured and ultimately satisfying dessert. As long as you don’t expect your desserts to have been infantilised using some debased form of chocolate or other goo goo sweetness, then you’ll likely get along with it just fine. Food that’s too ugly for Instagram. Although that’s no bad thing. One area where Old Tree is quite obviously at an immediate disadvantage is in its choice of non-alcoholic drinks. 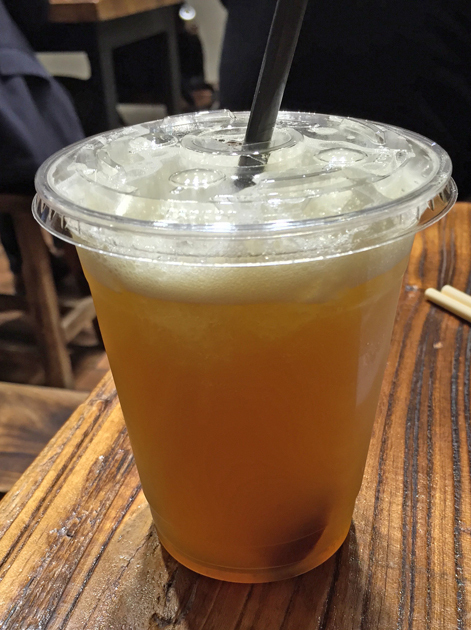 The iced plum green tea had the lip-pursing tang of sour umeboshi which won’t suit everyone. Heck, it didn’t suite me and I usually love sour things, including umbeoshi. It didn’t help that it clashed with the tannic taste of the green tea which I’m fairly certain was sencha. 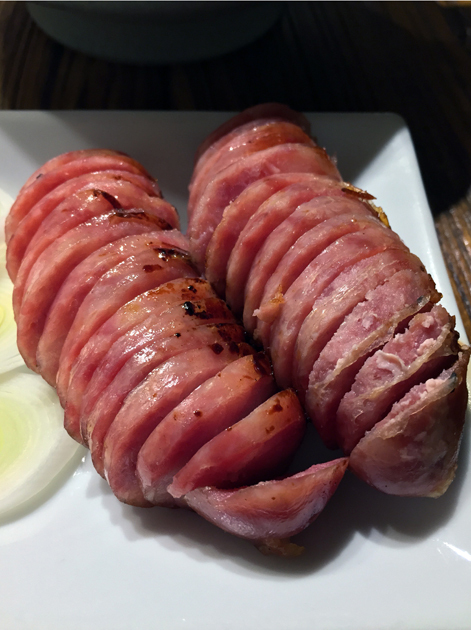 The Taiwanese sausages were surprisingly bland with none of the coarse fatty unctuousness and umami that I’d expect from a wind-dried Chinese-style sausage. 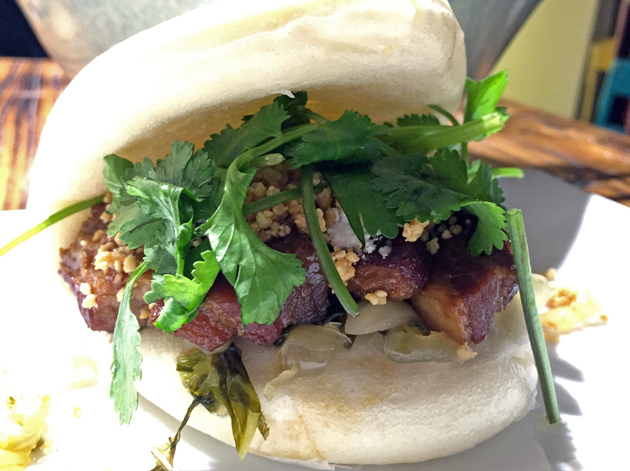 Bao, Xu’s progenitor, has nothing to fear from Old Tree’s gua bao. While the fatty and woody pork had its charms, the limp bun, veg and peanuts left me unmoved. It’s not a terrible gua bao, just a somewhat mediocre one overall. The beef noodle soup, a flavoursome classic and crowd pleasing favourite in Taiwan, petered out quite quickly here. 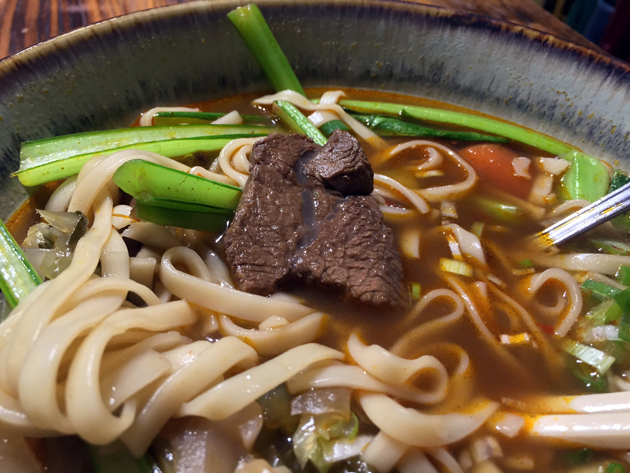 It started out well with tender and earthy slices of beef flank joined by tangy pickled vegetables and wheat noodles that had a modest thickness and width to them. 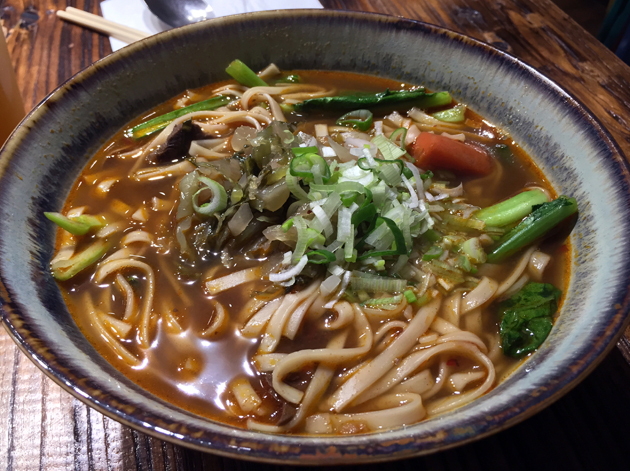 The soup, which should’ve been a gloriously umami thing tinged with a bit of spice, let the side down with its timid non-presence. 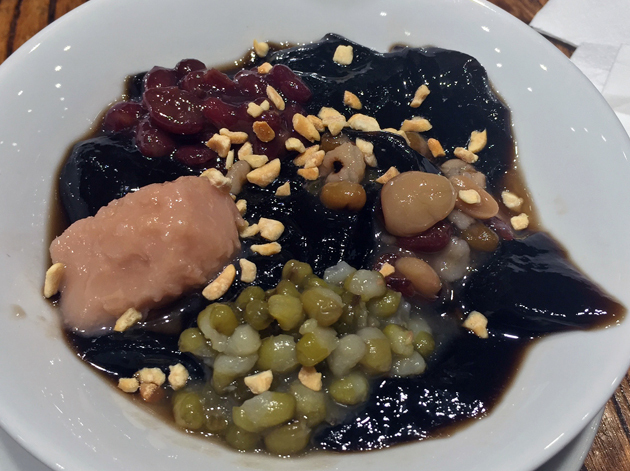 A mixture of beans, taro and tapioca pearls in longan tea was much a drink as it was a dessert. The earthy, musky and nutty rollerball disco meshed well with the lightly sweet, if not at all fruity longan tea. I enjoyed it, but it won’t be to everyone’s taste – when served warm (you can also have it chilled), it was effectively a liquidised version of roasted chestnuts. Given the generally decent state of the the warm longan dessert immediately above, the iced longan tea was surprisingly unbalanced. It tasted more of the fruit than tea, with an extra dollop of excessive sweetness for guaranteed enamel erosion. 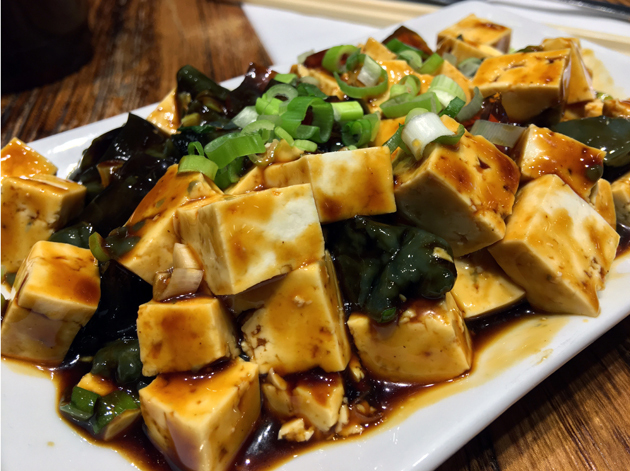 A tossed together mixture of soft, squidgy tofu and preserved egg was surprisingly tame given how powerfully strident Chinese preserved eggs can be. This, along with the underwhelming quality of the tofu and the generic saltiness of the sauce, made for a comprehensively disappointing dish. 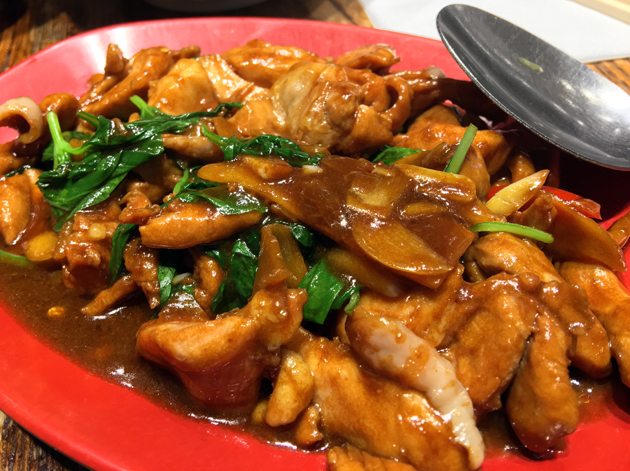 Three cups chicken can be a gloriously flavoursome thing, mixing and somehow balancing the flavours of sesame oil, rice wine and soy sauce. That certainly wasn’t the case here – bog-standard chicken lashed and bludgeoned with a sauce that would be better suited as a paint thinner due to its grimace-inducing astringency. Three cups, one non-gender specific individual. Yes, there’s probably a viral video out there somewhere. Pork belly noodle soup didn’t just rely on fatty, aniseed-laced chunks and slices of pork belly for its meaty joys. Minced pork packed an umami hint, while the milky noodles with just the right amount of softness and bite were joined by crisp greens. 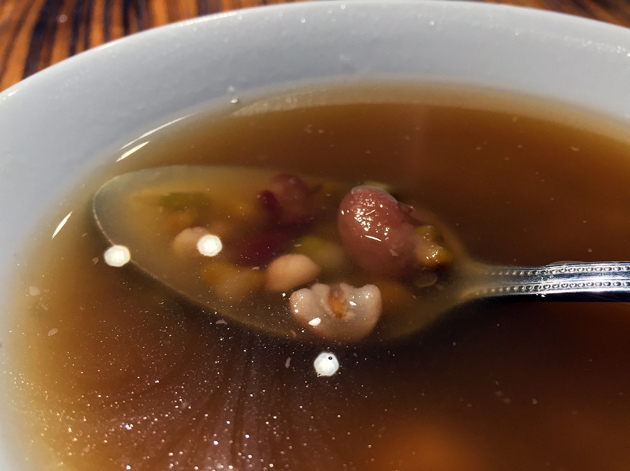 It was all moderately pleasing in an overly polite and genteel sort of way, which meant the neutral-tasting soup felt like less a conscious decision to allow the other flavours to shine through and more of a slap-dash shrug. I desperately wanted Old Tree Daiwan Bee to be far better than it turned out to be. 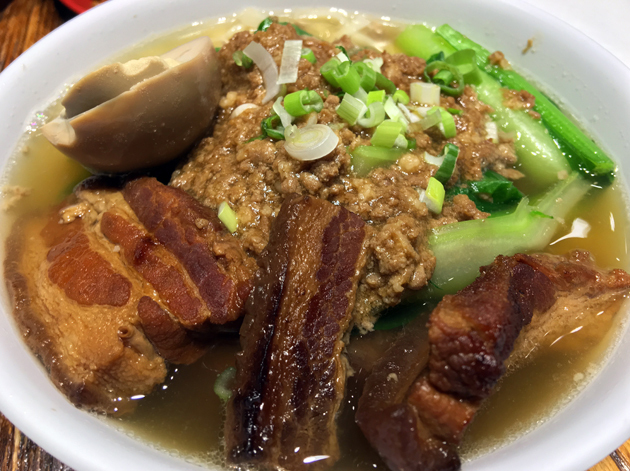 The cuisine of Taiwan is a glorious body of work, disparate dishes brought together from all over the mainland and bound together with an assured and unshowy sense of sophistication. Sadly, very little of that is discernible at Old Tree Daiwan Bee. There is some joy to be found here and there, but much it wouldn’t pass muster at a Taipei night market. It’s not bad if you want both a quick bite and a change from the largely Cantonese fare of Chinatown. Just do so in the realisation that it’s a very pale imitation of Taiwan’s multifaceted glories. Opening Hours: Monday-Friday noon-22.30, Saturday noon-23.00 and Sunday noon-22.00. Average cost for one, including soft drinks: £25-35 approx. Tags: beans, century egg, chicken, egg, gua bao, hirata buns, iced tea, jelly, london, noodle soup, old tree daiwan bee, omelette, oyster, oysters, plum, pork belly, restaurant, review, sausage, tapioca, taro, tofu. Bookmark the permalink.